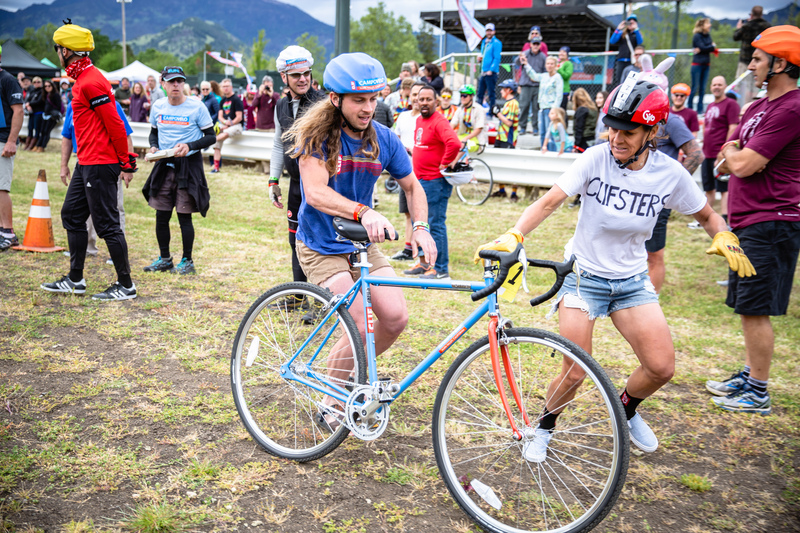 Calistoga, Calif. (March 13, 2019) – The third annual CLIF CampoVelo Napa Valley taking place April 26-28, 2019, has announced individual event tickets are now available for the annual Saturday Night at the Speedway, a full-on bicycle party at the ultimate location: the Calistoga Speedway race car track in the Napa Valley. Inspired by the cult-classic, coming of age film Breaking Away and Indiana University’s Little 500 race, Saturday Night at the Speedway made its debut in 2018 as one of the most enjoyable and entertaining events during the CampoVelo weekend, featuring food trucks, live music, beer and wine. The main event of the evening is a bicycle relay race around the half-mile track, where teams of four send racers around the track, one at a time, in hopes of becoming the fastest team to get all four riders across the finish line. Instead of a baton to pass in the transition zone, riders will pass single-speed bikes. No bikes are necessary, as CampoVelo has provided single-speed bikes by made-in-the-USA Detroit Bike company. NBC Sports Tour de France Announcer, Former 7-Eleven Pro Cyclist, and all-round fan favorite Bob Roll returns as the course announcer for the night, providing his special kind of color commentary for the races. Attendees can join a team or just come out and enjoy the action and hilarity with a glass of Napa Valley’s finest in hand, including libations from several of Napa best breweries and wineries offering everything from pilzners to pinots, and IPAs to cabernets. Napa Valley Food Trucks offer fresh flavors on wheels with something for everyone, and live music from The Mattson 2 and Hëctør is included in the price of admission. CLIF Bar will be on site sampling delicious Nut Butter Filled bars alongside a campfire lounge to keep attendees warm as the sun sets and the party rocks on! Proceeds from the event will help support the Napa Valley Vine Trail, a non-profit coalition dedicated to building a class 1 paved bike path from Calistoga to the Vallejo Ferry. To date, 19.5 miles have been constructed of the 47-mile plan. Already registered for the weekend? Sign up for a relay team at http://www.campovelo.com/speedway/. CampoVelo Napa Valley combines world class cycling, wellness, cuisine, libations, and fundraising into a unique three-day event in the heart of America’s preeminent wine growing region. With the mantra “do good, one pedal stroke at a time,” CampoVelo benefits the Napa Valley Vine Trail Coalition and Chefs Cycle for No Kid Hungry. For more information and the full weekend itinerary, visit www.campovelo.com. CampoVelo Napa Valley, hosted by Chef Chris Cosentino and produced by Ride Napa Valley, is an annual three-day weekend blending the best of the culinary, cycling, and wellness worlds. Cosentino, along with twenty other chefs, pro-cyclists, winemakers, and other notable people lead the weekend in a myriad of activities designed to support local and national non-profit organizations including the Napa Valley Vine Trail Coalition and Chefs Cycle for No Kid Hungry. Clif Bar & Company crafts nutritious and organic food to feed and inspire adventure, including the CLIF BAR® energy bar; CLIF Kid™, Nourishing Kids in Motion®; and LUNA®, The Whole Nutrition Bar. Family and employee-owned, the company is committed to sustaining its people, brands, business, community and the planet. For more information on Clif Bar & Company, please visit www.clifbar.com, check out our Facebook page at www.facebook.com/clifbar and follow us at: www.twitter.com/clifbar and www.instagram.com/clifbar.